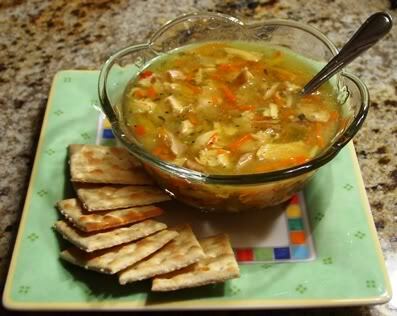 Homemade chicken soup – Perfect to warm you on a Cold winter night of Holiday shopping. Beef Stock: Preheat oven to 450°F. Melt 2 tablespoons butter in a large roasting pan. Add 4 pounds beef bones and brown in oven, about 10 minutes, stirring pieces frequently. Add 2 large sliced onions, 2 sliced carrots, 2 sliced ribs celery with leaves and roast until browned. Transfer bones and vegetables to a large stock pot. Pour off fat from roasting pan and deglaze with 1 cup hot water, scraping up browned bits from bottom of pan; pour into stockpot. Add 1 bay leaf, 4 peppercorns, 2 sprigs parsley and 1 teaspoon dried thyme to stock-pot and cover with 4 quarts cold water. Slowly bring to a boil and lower heat to a simmer. Simmer 4 to 5 hours, skimming off surface foam during first 30 minutes of cooking; strain. Makes about 3 quarts.